Sponsored by The Loyola Foundation, Inc. We hope the Gospel of Jesus Christ, and the witness of Catholic Women Preach, will continue to inspire, encourage, and influence all with joy. I have always been a little too serious for my own good. I am also wildly perfectionistic. This unfortunate blend has often made my life more difficult than needs to be. I routinely set standards for myself that are severe and unrealistic. It can be difficult for me to make arguably simple decisions, as I will spend hours agonizing over inconsequential details. If I do make a decision, you can bet that I’ll second-guess it. I am an exceptionally talented procrastinator, because we all know that unfinished work is better than work imperfectly done. My inner voice can be unrelentingly critical and full of self-doubt, and I have spent what feels like an eternity writing this homily because, well, word choice. The thing is, I feel enormous pressure to live a life full of purpose. I want to contribute something meaningful and of beauty to the world, and, honestly, I want to do it flawlessly. Do you remember that time I told you I was too serious for my own good? With this in mind, today’s selection of readings gives a soul like mine a lot of hope. To paraphrase Saint Paul, he writes: “I am confident that the one who began a good work in you will see it through to completion.” Every time I hear these words, I feel a wave of relief. They remind me that I am not alone and call me back to reality. Every time I feel paralyzed or am filled with fear or anxiety, I am called to remember that God is walking with me. They also gently invite me to stop taking myself so seriously and rein in my ego. “Calm down, Becca. It’s not up to you to save the world today.” They don’t absolve me of responsibility either, as they strongly suggest there is good and important work to do – work that is uniquely mine. I would also assert that a strong theme that emerges from today’s selection of readings is that as God’s people we are called to focus our work on justice. In the Gospel reading, John the Baptist -- echoing the prophet Isaiah -- proclaims, “Every valley shall be filled and every mountain and hill shall be made low. The winding roads shall made straight, and the rough ways smooth.” Baruch uses similar metaphors to console Jerusalem. In theological terms, God is calling us to participate in the creation of a more just and compassionate world. As we do this meaningful and often difficult work, I find it profoundly moving to think about a God who joyfully accompanies us. Today we hear that “God is leading Israel in joy by the light of his glory with mercy and justice for company.” The choice of the word joy is important here, as it implies something deeper than fleeting satisfaction or temporary happiness. Joy is a virtue that stays with us for the long haul, under any circumstance. The messages we hear today are powerful for each and every one of us, not just my fellow perfectionists. If remembered, I think they have the potential to change one’s life. What we hear is that God is calling each of us, regardless our circumstances or station in life, to discipleship. We are called to find and dedicate ourselves to the work that is uniquely ours to do, work that contributes to the creation of a more just and compassionate world. It is interesting to note that the Word of God came to John the Baptist in the desert, someone regarded at the time as an utter nobody. God isn’t interested in perfect. She is interested in our willingness to try. And, as we try, we are called to remember that we are being joyfully accompanied, in good times and bad. For each of us, how we embody these messages and live them out will look different. It is important for each of us to understand what we need to stay focused and to keep going. In my own life, I have tried to look inward, outward, and upward. It has not always been easy for me to understand what work is mine to do – and what is not. When Saint Paul wrote, “And this is my prayer: that your love may increase ever more and more in knowledge and every kind of perception, to discern what is of value,” I think that was exactly what he was getting at. This is difficult work. I have had an especially difficult time with this one as I navigate my current path. I am a Maryknoll Lay Missioner in El Salvador with a previous assignment in Brazil. While I love my work, it very much puts me in touch with my limitations. I often feel inadequate or ineffective and worry constantly about the significance of my presence, whether it be in a prison in São Paulo or a primary school outside of San Salvador. I also struggle with questions of timing. How long will I be here? What is going to happen? Is this right place for me to be? Is there enough time to do all the things I would like to do in life? What the hell am I even doing here? During these moments of confusion or doubt, I try to look inward. What I mean by this is, I try to get curious about the internal narratives that aren’t serving me well. What is holding me back, and where is this coming from? This requires a fair amount of unlearning in my case, as we unfortunately live in a world that has a very narrow definition of success and timeline for achieving it. When I filled with doubt, I have to do the inner work of asking myself if these fears stem from comparing my path to one that belongs to someone else. The answer is always yes. In your own life, how can you commit to the inner work necessary to sustain whatever your mission is? I also try to look outward. I don’t like to do this very much because this requires me to be vulnerable enough to ask for help from others. However, it is critical to do this when I feel lost, and I am lucky to have a core group of people that can always point me back to true north. A few weeks ago a close friend suggested I create a vision board to help with the inevitable discomfort that comes with my recent relocation to El Salvador. At this point I am sure it’s obvious we are both giant nerds, but homegirl does have a point. In a similar vein, another dear friend recently reminded me that “discouragement is not of God.” The uncertainty and panic I feel are coming from somewhere else. My mother assured me that there is, in fact, enough time… for all the things. In your own life, who is it that can offer encouragement and hold you accountable? The third thing I try to do is look upward. I mentioned that looking inward and outward was difficult for me, but this one takes the cake. To look upward is my way of saying that I need to recognize I am not actually in control of anything. There is something greater than I at work here, and no amount of orchestrating things perfectly matters. As I have grown in awareness, I recognize that I am a perfectionist because the alternative requires vulnerability. I realize that trying to make everything perfect is one way I try to exert control over the uncertainty of living. It’s a defense mechanism. I want to take a good look at the map before I start driving. I want to know that what I am doing is going to work before starting. Each of us has something that holds us back – that gives us pause. You might not be a perfectionist, but I am sure there is something that keeps you from feeling like you can move forward or that you are enough as is! Also, looking at current state of our world doesn’t exactly inspire confidence. There is so much happening right now outside of our control that is devastating, that I think it is easy to turn to choose cynicism over hope. The call to move forward is difficult. However, this is no way to live, and is certainly not reflective of the Gospel call to keep working for a more just and compassionate world - even in the midst of uncertainty or difficulty. To look upward allows us all as individuals and as a faith community to move forward with hope. In your own life, what practices can you cultivate that will help you as an individual and within your own faith community that can help you to remember to look upward? To conclude, I leave you with words attributed to Audre Lorde that a mentor shared with me during a moment when I think she could perceive I was struggling: “When I dare to be powerful, to use my strength in the service of my vision, then it becomes less and less important whether I am afraid.” And, in my case, I would add, it becomes less and less important whether or not I am perfect. Becca is passionate about spirituality, service, and cross-cultural mission. A native Kansan, she studied English and Sociology at Emporia State University. As an Amate House Volunteer in Chicago, she worked for the Catholic Charities of Chicago and Heartland Human Care Services. Becca earned a Master of Arts in Theological Studies from the University of Dayton where she also worked as a Residence Life Campus Minister. Following graduate studies, she returned to Chicago to serve Amate House for four years as a Program and Recruitment Coordinator. Becca joined Maryknoll Lay Missioners in 2016. MKLM is a lay Catholic organization inspired by Jesus and the Gospel to live and work for justice in communities around the world. She recently transferred to El Salvador and is currently engaged in the process of learning Spanish. 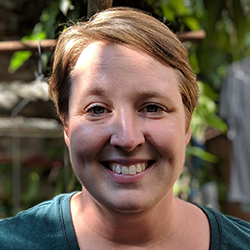 In 2019, she will begin a new ministry at a primary school, Patronato Lidia Coggiola, in Zaragoza, a small town just outside of San Salvador. Previously, Becca was assigned to work in São Paulo, Brazil for MKLM. Her work was focused on offering pastoral accompaniment and support to incarcerated populations, primarily through a collaboration with the Prison Pastoral for the Archdiocese of São Paulo. She also contributed to Projecto Egressas at a Brazilian NGO, Instituto Terra, Trabalho, e Cidadania, a project that addresses the specific reentry issues women face when they leave prison. In addition to the communities listed above, Becca is deeply grateful to her family, friends, St. Teresa of Avila Parish in Chicago, and Kolbe House, the Catholic Jail Ministry for the Archdiocese of Chicago, all of whom have encouraged her to find and share her authentic voice.